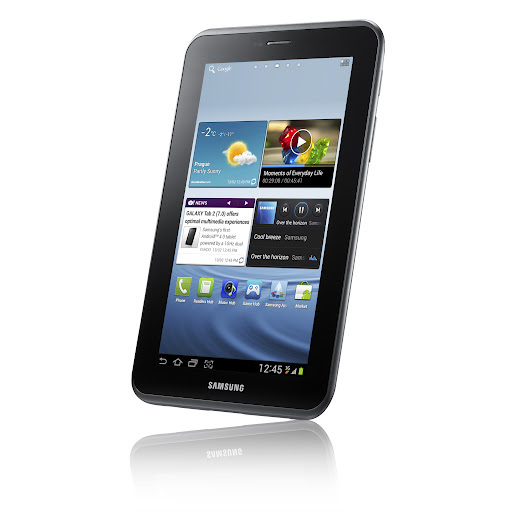 Ahead of Mobile World Congress, Samsung has announced the forthcoming launch of the Galaxy Tab 2, a 7-inch-screened sequel to its popular Android tablet. The new version of the original 7-inch Galaxy Tab sports Ice Cream Sandwich (Android 4.0) and a 1 GHz processor. It will be available in both WiFi and WiFi+3G models. The 3G option offers HSPA＋ 21Mbps speeds, where supported. The screen is a WSVGA 1024×600 PLS TFT. As you’d expect, the usual suite of Samsung apps is included, such as Music Hub, Readers Hub and Games Hub. A new Video Hub will offer over 1,000 film titles for purchase or rent, plus reviews, trailers and recommendations. Also new with the Galaxy Tab 2 is AllShare Play, a content-sharing service that allows users to play or live-stream multimedia content on their tablet from PCs, Samsung smart devices as well as third-party cloud storage service, although Samsung isn’t saying which ones as yet. The company says that users will also be able to transfer content from the tablet to other devices or directly to Web services. The Galaxy Tab 2 will be available from next month, although it’s unclear which markets will get it first. We expect that we’ll have a chance to go hands-on with it in two weeks, at Mobile World Congress in Barcelona. You can peruse the device’s full specs in Samsung’s announcement.